This video selector features high quality circuitry for no signal loss at any point. It contains three isolated switches (each is a three to one) and works with displays that have multiple inputs. 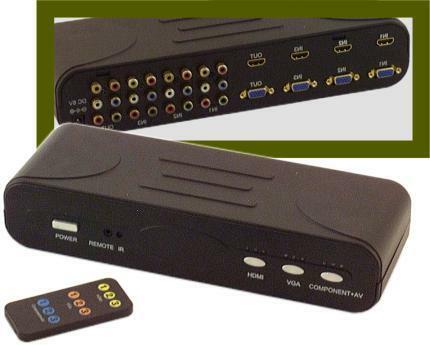 For example, if the display screen has HDMI, VGA and Component, up to 9 video sources (three of each interface type) can be connected to this switch, and then three connections can be ran from the switch to the display. The switch doesn't "bridge" or translate from one interface type to another, the three types are isolated. The switch contains a repeater that allows cable lengths of up to 55 feet. Below is a visual illustration of the selector.